One of the perks of working at a university is getting the opportunity to meet interesting people, especially those you may have admired from afar. Often, without having to pay extra. Tonight, my oldest daughter Maddi and I got to listen to Temple Grandin. Because I am on the working group that invited Dr. Grandin, I had the opportunity to meet her in a small-group setting before her lecture. I can appreciate that many would think this isn’t such a big deal. Ok. To me, it was an experience that I looked forward to all day. During our small-group discussion, Dr. Grandin answered questions ranging from having a successful life to children and adults with high functioning autism. One of the most central points Dr. Grandin made was the need for children to have “interesting work.” Children who are gifted in one aspect or another will be motivated by their own interests and capabilities. The work of adults is to extend and nurture this natural interest and motivation within the parameters of the child’s stage of development. Therefore, Dr. Grandin said, a 3rd grader who is capable of doing high-school-level math should be able to do high-school-level math in her 3rd-grade class. She also emphasized the need for adults to set parameters and structure expectations so children with special needs (all children, I thought) do not fill their entire time with repetitive activities that reinforce their obsessions and prevent them from stretching themselves. Children with autism (most people, I thought) will tend to focus on the one thing they like to do over and over again, without pushing themselves to move beyond and grow. Children who are drawn to playing video games, for example, can benefit greatly from learning how to create, design, and program their own games. I was delighted to hear Dr. Grandin speak well of MOOCs and makerspaces as potential places on the interwebs and IRL where a young mind can develop and follow her own inclinations and still find benefiting structure. But, Dr. Grandin did emphasize, the adults must help children set limits and parameters to their pursuit of knowledge and skills. Classes can provide this needed structure and discipline. Makerspaces can provide the social encounters children need, while at the same time focus their desire and inclination to build and create. Another tidbit of thought Dr. Grandin provided during the small-group discussion time was the importance of physical activity. Children with autism need this (don’t we all?). The problem, really, is doing it. Children with autism who display argumentative and combative behaviors benefit greatly from daily physical activity. I admit I hate to exercise. But I don’t doubt there’s something to the mind-body connection that I don’t benefit from because I have a hard time motivating myself to move my body. 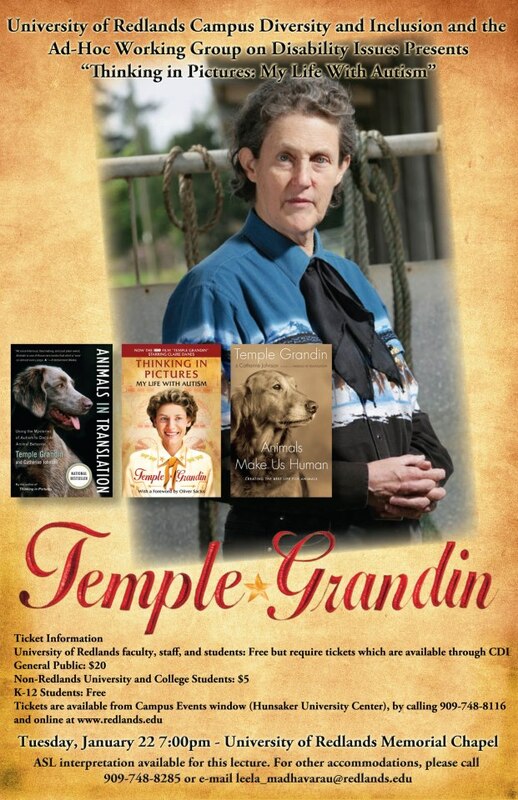 During our small-group discussion and the larger lecture, which drew a crowd that filled most of the Memorial Chapel at University of Redlands, Dr. Grandin emphasized the different ways of thinking and the woeful condition that precludes many people with these differences from succeeding or being accepted by others. She stressed the need to teach work skills and incorporate work ethics in our education system. These are things that used to be part of the education curriculum, but have disappeared in favor of other job-related skills. Learning how to do things, through agricultural science, farm and animal care, horticulture, wood shop, or cooking classes, give children the means to discover and develop their own ways of thinking. This is just as important to success in life as keyboarding, balancing a checkbook, and marching in line while playing a brass instrument. In fact, they support each other. I can’t agree more. Peter and I chose to send our two daughters to a Montessori school for precisely these reasons. Maddi, a sophomore at The Grove School, is thriving at such an environment. We plan for Penny, currently a 5th grader, to attend The Grove once she is eligible at 7th grade.